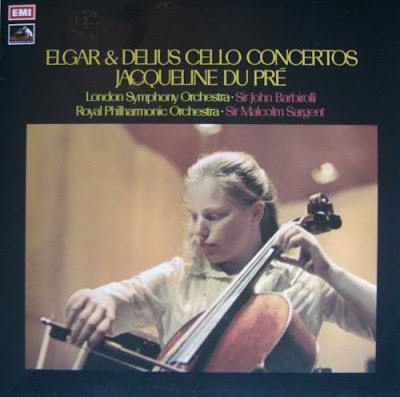 BBC4 TV is showing Christopher Nupen's film of Jacqueline du Pré, which includes her performing the Elgar Concerto, tonight (Sept 26) at 7.30 UK time. This means it will be available until October 2 on i-Player. This is the first in a BBC4 series of Nupen's legendary documentaries about musicians. The others portray Itzhak Perlman, Vladimir Ashkenazy, Evgeny Kissin and Nathan Milstein, as well as a film about Amman-born musician Karim Said, a protégé of Daniel Barenboim's. Jackie also made a classic recording of the Beethoven Sonatas with Barenboim, which is a nice cue for Elgar carrying on Beethoven's business. The du Pré/Barenboim recording of the Franck Violin Sonata is one of the most exciting things I've ever heard. I once described it to a friend as giving the impression that the players, their instruments, and the studio are about to burst in flames at any moment.